Spring is in the air and once again it is time to get around to the tasks that seem daunting but once they are done, make you feel so much better!! Cleaning out the pantry is one such task! But I promise you – You will save time and money when your pantry is cleaned out and organized. You will need to print off the Pantry Assessment and Pantry Checklist to get started…So if you are serious in getting your pantry cleaned up! Let’s get this pantry started so DOWNLOAD these now. First things first – We need to empty the pantry COMPLETELY and Clean it. Start placing everything in the pantry on a bench top or table. Now go an wipe down all the pantry surfaces so it is clean and ready to go. Magic Erasers are great if there is a bit of grime on the shelves – just add water and go. If you want to use a surface cleaner – look for one that is low tox. You don’t want stronger surface sprays around your food. I have created 12 cleaning recipes using Essential oils. They are effective, smell amazing and better for you!! You can see my post HERE and download the 12 recipes. Now back to the food categories you have sorted on your work space. You should have a reduced amount to go back into your clean pantry…But FIRST let’s get it all in order. The secret to keeping the amount of food in your pantry manageable – Keep pantries filled with items you plan to use within one or two month’s time only — Anything else and you’ll be wasting space. Storing your oils all together on a tray is a good idea. It means no oily residue left on your shelves. But It is your pantry so create the zones that work for you!! If there are items your children need to access – like breakfast ingredients. Make sure that they are placed where they can easily be accessed and remain orderly. Now how are you going to store and organize everything? Jars and canisters do not have to match if they are nicely labelled! Put as many ingredients and food types into clear canisters either glass or BPA free plastic for a longer life and make sure they are airtight. Airtight containers also mean keep pantry moths and rodents out of your families food. Yep – I got you!! Cooking Gods released an Ultimate Pantry and spice jar label set. Over 250 chalkboard labels pre printed and some are blank. 281 Chalkboard labels – click image to get your discount! Smaller items can be put into storage bins. Buy storage bins that are easy to see into – you can have clear, wired baskets or low trays. Examples to put into baskets or tubs are, Chips, Snacks, assorted teas, dried fruits and nuts, soup and sauces. Now to put it all back!! Place all the new storage solutions into the pantry –if you haven’t yet put down shelf lining – do this now!. Put the racks up and any new shelves. Empty all your items into the new containers and label straight away – do not mix up your canisters and mislabel your flours! Now to put your categories into the zones you worked out. All labels to the front and of course make sure the older dated items are at the front to use first. Now stand back – does it all work – Do you need to spread things out or bring things in a little tighter. Move things around if needed. Come back in 5 days and see if all the zones are working and change what needs to be adjusted. Now – A big satisfied sigh of relief – YOU DID IT!!!! A good pantry can’t be beat. 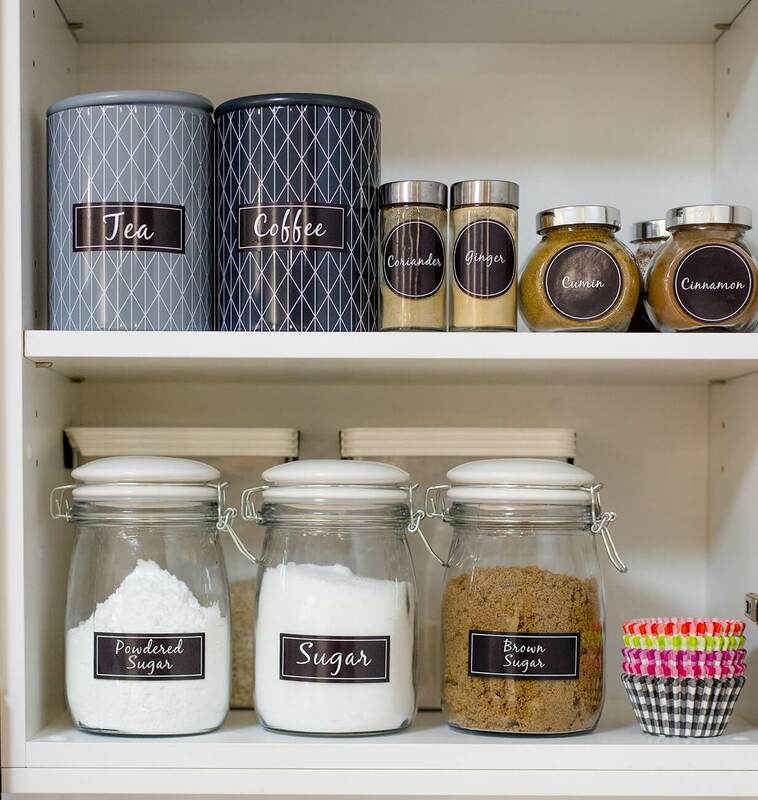 Good ideas – I love a labeled pantry! Thanks for the reminder! Our pantry isn’t in our kitchen because of space, and it often gets overlooked. I’m sure it needs a good cleaning! Great tips & pix! I sooooo need to do this, and soon! Thanks for sharing! Great tips. I love the black labels. I love organizing my cabinets especially in the kitchen and bathroom. These tips and tricks will definitely be put into good use. Thank you!